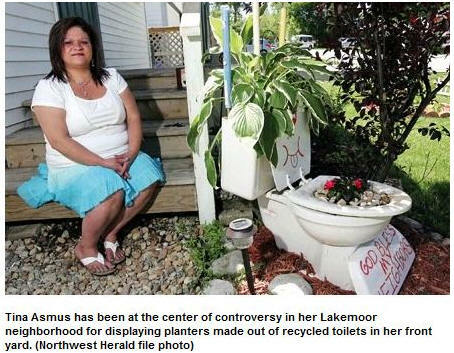 POTTY PLANTER WOMAN WANTS LAW FLUSHED - KRV Legal, Inc.
WOODSTOCK – A Lakemoor woman who was ticketed for displaying two toilets and a sink filled with flowers wants a judge to declare the village ordinance that she was cited under unconstitutional. Tina Asmus was fined $25 last week after failing to remove the unusual planters from her front yard at 134 S. Highland Drive despite receiving a 30-day warning. An attorney for Asmus filed paperwork Thursday asking a judge to stop the village from enforcing the ordinance while determining its constitutionality. In the McHenry County court filing, Asmus’ attorney, George Kililis, said other village property owners displayed water-well pumps, tire swings, parking meters, whiskey barrels and rug beaters, among other implements, on their property. There also is a full-size Caterpillar tractor in front of the International Union of Operating Engineers’ hall, Kililis said. Village President Todd Weihofen said the village planned to stand by its ordinance. He said the village’s recent enforcement efforts had been driven by complaints and obvious infractions.